On 20th September the late Reverend Dr. Oliver Lyseight was awarded a blue plaque by the Wolverhampton Civic & Historical Society in what marks an important chapter in the history of both Wolverhampton and of integration in the UK. Lyseight was the founder of the first black-led church in the nation, the New Testament Church of God, established in 1953 in Wolverhampton. The church now has 107 branches nationally and has played a key role in the development of the black community and religious life in Britain. 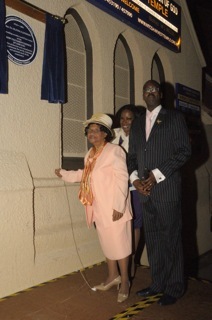 Rose Lyseight, Patrick Vernon OBE and Cllr Sandra Samuel at the unveiling ceremony. Many dignitaries attended the unveiling ceremony, including the Jamaican High Commissioner, Her Excellency Aloun Ndombet Assamba, Patrick Vernon OBE, Emma Reynolds MP, Pat McFadden MP, West Midlands Police & Crime Commissioner Bob Jones and his deputy Yvonne Mosquito, with the date chosen to coincide with the establishment of the first meeting of the church exactly 60 years ago. Lyseight is the first BAME (black, asian, minority ethnic) person in Wolverhampton to receive a blue plaque from the Society, who over the last 30 plus years have created 99 plaques for building and individuals. While his award reveals how far Britain has come in the fight against racism since the church’s establishment in the 1950s, Miliband highlighted in his statement that there is still plenty of work to be done. Lyseight was born on 11th December 1919 in the district of Claremont, Hanover Parish, Jamaica. After working as a War Food Administration Worker in the US during the second world war, alongside ministry work on either side of the war in Jamaica, he came to the UK on the ship Britannica, arriving at the Liverpool docks on 8th November 1951. In 2004 Lyseight was voted joint second in the 100 Great Black Britons survey, a campaign launched the year before by Patrick Vernon OBE, which makes accessible the history of 1,000 years of black achievement in Britain. Lyseight passed away on 28th February 2006. The unveiling of the blue plaque also supports the campaign around recognition of Windrush Day as an annual event celebrating Caribbean and other migrant communities’ contribution to Britain. Click here to read more about why Windrush Day matters.